This gorgeous decal would be perfect on any wall of your home! Vinyl is easy to apply and mess and damage free, making it the ideal way to decorate! This decal is 22"H x 50"W.
Due to the custom nature of my work, I cannot offer refunds o exchanges. Orders cannot be changed or cancelled once placed. To fulfil your order, you must provide me with certain information (which you authorised Etsy to provide to me), such as your name, email address, postal address and the details of the product that you’re ordering. Due to the customized and made to order nature of our products, we are not able to accept returns or exchanges. (Initials, names, sizes, colors, and fonts selected are all customizations that make your order especially for you!) We hold no stock. All orders are custom cut after order is placed. We cannot accept cancellation requests once production of an order has started. Are vinyl decals compatible with my walls/paint? We cannot guarantee that decals will adhere to all surfaces, so we're not able to offer refunds for decals not adhering to your wall/surface. If you've never applied die-cut decals before, we would strongly suggest requesting a free sample decal to test with prior to making a purchase. Sometimes. Custom/from scratch designs will depend on several factors such as our schedule, our kids' schedules, current order volume at the time of request, etc. Please be aware that, when available, custom/from scratch design will cost more due to the amount of proofing, messaging, design file creating involved. Please convo us to check availability/pricing before purchasing. What is a die cut decal? A decal cut out of a roll of vinyl. Our die cut decals do NOT contain clear outlines or borders, giving you the look of being painted on. A crisp, clear, professional result! Are wall decals removable? Are they reusable? Yes, indoor vinyl is removable. We use the highest quality indoor vinyl on the market, and it removes easily by simply peeling it back off very SLOWLY. The heat of a hair dryer on low just beforehand will soften the vinyl for easier removal. No, die-cut vinyl decals are not reusable. They cannot be reused, or moved/re-positioned. They are a one time use only. I would like to expedite my order. Is this an option? No, we do not offer any type of overnight delivery for orders at this time. If I purchase today, when will this deliver? You can now view the estimated to deliver date range for every listing! If on a desktop, it's to the right of the listing photo, if on mobile app, scroll down under the photo to the section titled: Shipping & Returns. The estimated delivery range is calculated by adding current production time + mail transit time. Delivery dates are estimates only and in no way guaranteed by the USPS. All orders are mailed via the USPS. When you order ships you will receive an email with your tracking number and you can check the status of your order at any time with this number. Please Note-We are not able to issue refunds or replacements for packages that are scanned as "Delivered" via your tracking number. I'm not sure if vinyl will stick to my wall/surface. Do you offer sample decals? Yes, we do offer sample decals to test with prior to making a purchase. 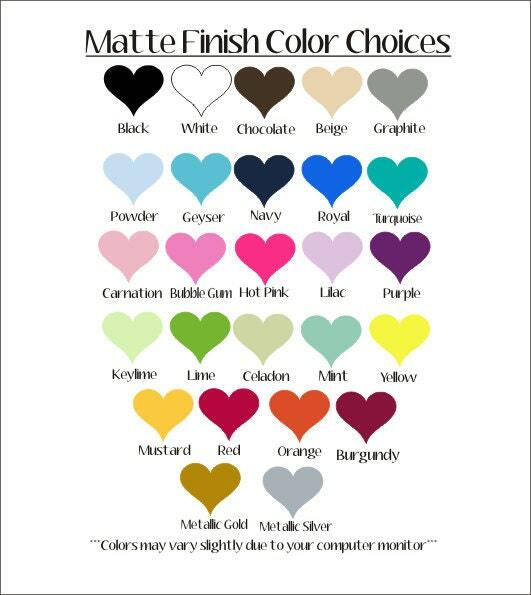 We also offer color samples. These are free of charge, and all you need to do is send us a convo to request. Please include your name, mailing address, and the colors you are interested in seeing. We offer these test decals and color samples free of charge to our buyers because we want you to be thrilled with your decal purchase. Since we offer these at no charge/risk to buyers, we cannot be responsible for decals not adhering, or colors not matching your decor after placing an order. If you want to be certain on adhesion and colors, we highly suggest requesting samples before placing an order. We only send proofs upon request. Proofing is very time consuming and in order to keep our super fast turnaround time and get you your order asap, we don't offer proofs as a standard practice. However, we will send one if you request one. Be aware that if you prefer a proof, production of your order will not be able to start until proofs are approved. Please be sure that you are signed up to receive convos and notifications through the convo system here on etsy to keep this seamless and so as not to halt production/processing of orders. **Please Note**We are not able to proof for small orders of $20 or less. Thank you for your understanding. Do you sell any type of boards, wood pieces, glass or mirrors? No. We only sell decals. Decals are the adhesive lettering shown in our listing photos. We do not sell any type of boards, stands, flowers, etc in our shop. These items are props and not included in purchase price. Wonderful wall decor! 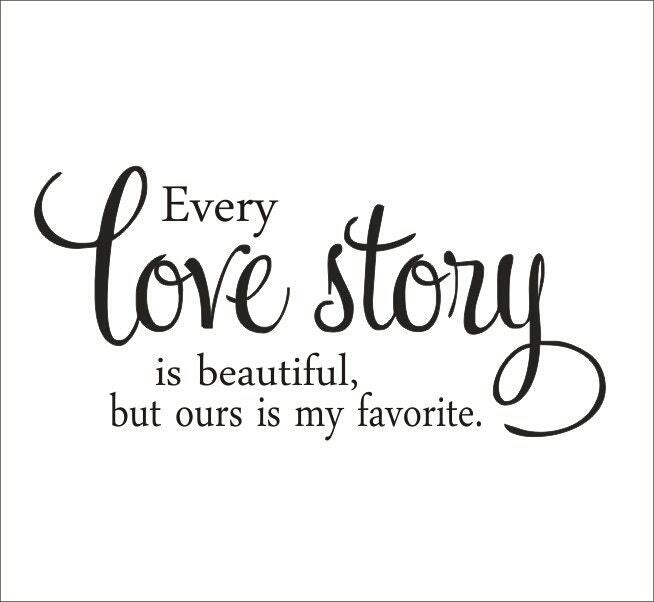 My husband and I love it and it reminds us of our beautiful love story every time we go to bed. Customer service is great as well. They were willing to hold my order and sent me a sample decal to make sure it will work on my walls. :) Thank you CustomVinylbyBridge! Very fast service and turn around. Was not easy to transfer, but the cost and service-- couldn't beat it, otherwise! It looks beautiful on my wall! I love the matte finish! Shipped so fast! Thank you! It looks great on the wall. Im glad I found this huge size of decal. Thanks!! !